Churches of Scientology sponsor roundtables and seminars on human trafficking to raise public awareness and get effective action taken to eradicate this international scourge. As many as 27 million people live in slavery today, and the U.S. Department of State estimates that 14,000 - 17,000 are trafficked into the United States annually. 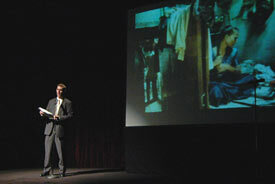 A Church-co-sponsored seminar on human trafficking held early last year included a representative from the Department of Justice. 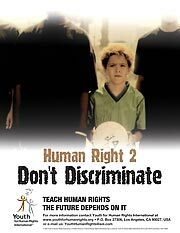 At a gathering at the Church of Scientology Celebrity Centre International to mark Human Rights Day on December 10, 2004, a special agent from the FBI's Civil Rights Unit gave a powerful presentation on this issue. We welcome any information or help to combat human trafficking. Please contact us if you have any ideas on programs we can work on together, submit articles and news on the subject, or send any other suggestions to Leisa Goodman, Human Rights Director of the Church of Scientology International at humanrightsdir@scientology.net. The following are trademarks and services marks owned by Religious Technology Center, Los Angeles, California, USA. These marks are licensed for use by the Church of Scientology International and its affiliated organizations and have been registered in many countries of the world. DIANETICS, FLAG, FREEDOM, L. RON HUBBARD and SCIENTOLOGY.